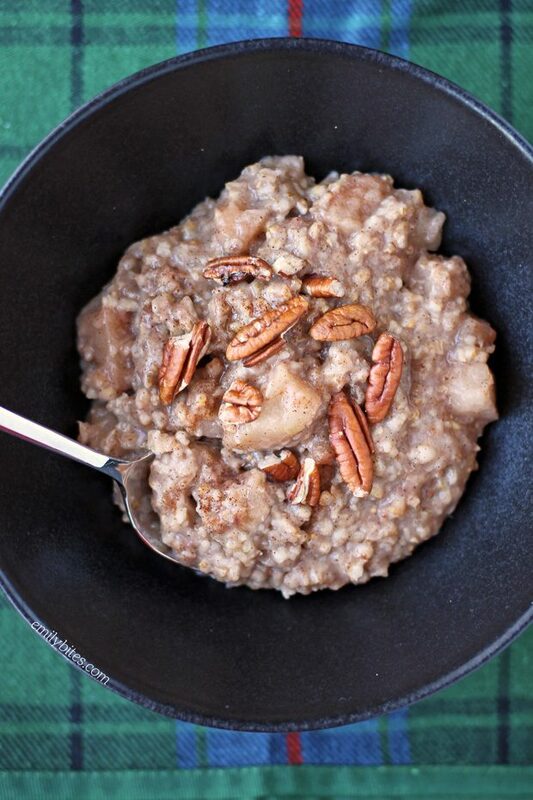 Everyone loves their slow cooker for having dinner ready when they get home from work, but with this Apple Cinnamon Slow Cooker Oatmeal you can put your slow cooker to work overnight and have a hot breakfast waiting when you wake up! It couldn’t be easier. Just combine the ingredients in the slow cooker right before you go to sleep and when your alarm goes off in the AM all you have to do is wake up and enjoy. This oatmeal is super filling and lightly sweet, perfect for fall. It’s perfect on its own but you can also customize it by mixing in nuts, seeds or additional fruits. I pictured it here with a few pecans on top and I also love tossing in a few raisins. It’s easy to make it your own and it’s sure to fill you up and keep you satisfied. All that and it’s just 173 calories or 5 Weight Watchers SmartPoints per serving! Looking for more tasty lightened up breakfast recipes? Check out my Apple Streusel French Toast Muffins, Pear Gingerbread Baked Oatmeal Singles, Bubble Up Breakfast Casserole, Silver Dollar Banana Pancakes, Butternut Squash Autumn Frittata, Pumpkin Chocolate Baked Oatmeal Singles, Ham and Cheese Hash Brown Quiche, Sausage Stuffing Bake, Mini Dutch Baby Pancakes, Hummus and Feta Omelet, Carrot Cake Doughnuts, Sausage, Egg and Cheese Hash Brown Cups, Lemon Poppy Seed Pancakes, Blueberry Baked Oatmeal Singles and more in the breakfast section of my recipe index! This really looks like a good oatmeal recipe. YUM! Are the pecans calculated in the point value? Nope, just the ingredients listed in the recipe. Feel free to add any toppings or mix ins you like! Does this do well to reheat the next day? Do you know why you can’t use quick cooking oats? It’s all I have on hand! 🙂 Trying to avoid a trip to the grocery store – Thank you! Steel cut oats are tough so they hold up to being cooked for such a long time while still retaining texture. Quick cooking or old fashioned oats are likely to overcook. Also the amount of liquid in this recipe is calculated for using steel cut oats. For best results I would suggest waiting until you have time to grab some steel cut oats! Do you think this will freeze well? I was thinking about making a double batch and freeze some for another time. Making this tonight! I can’t wait!! I put some in the crock pot last night, but woke up to oatmeal soup! I followed the recipe exactly, so I don’t know what went wrong. Did you by any chance use the quick cooking steel cut oats? You really can’t use quick oats. The only time I have seen people get that result is when they used the quick steel cut oats. I’m sorry it didn’t turn out! So did I! So disappointed! Have you ever made a double batch? I have a 6 quart slow cooker. I am going to make this on Sunday morning, looks really good. 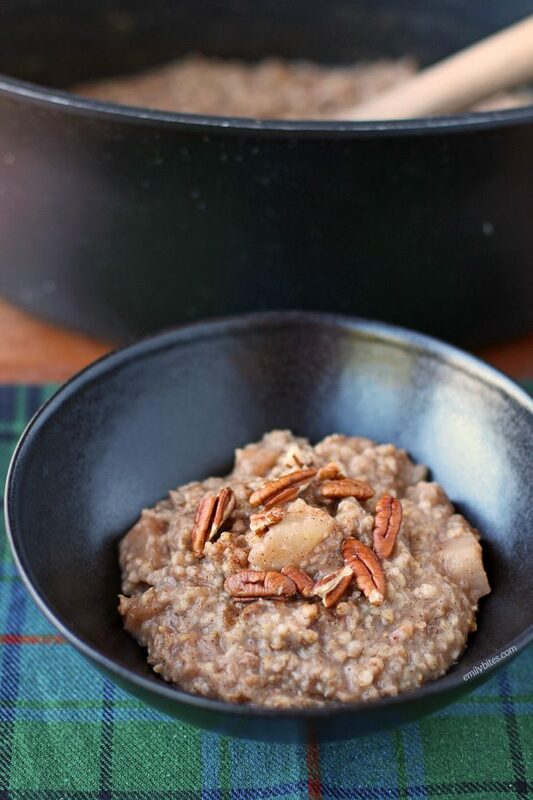 I just wanted to say that last weekend I made another slow cooker oatmeal recipe. It called for old fashioned oats cooked on low for 2 hours, and it came out great. Neither my son nor husband will touch steel-cut oats, which is why I used old-fashioned. Can you substitute with rolled oats? Nope, you really need to use the slow cooking steel cut oats. Wanted to say that I have tried so many of your recipes and they are down right delicious!! My family thanks you…. Btw… this recipe is great and I make it all the time. Is there any way you could use this a second day. I would be making it for one? This looks so delicious! I am thinking of trying it in my Instant Pot. Anyone else tried that? Could I keep it in the slow cooker for a tad longer than 8 hours? I would love to cook this recipe this weekend overnight, but I’m worried about oversleeping and ruining the recipe! I was so excited but mine came out wayyyy too soggy. Do I just cook it longer? I did the correct measurements. Help, it smells so good! I haven’t had that happen so I’m not sure what to do but yeah I would probably try cooking it longer. 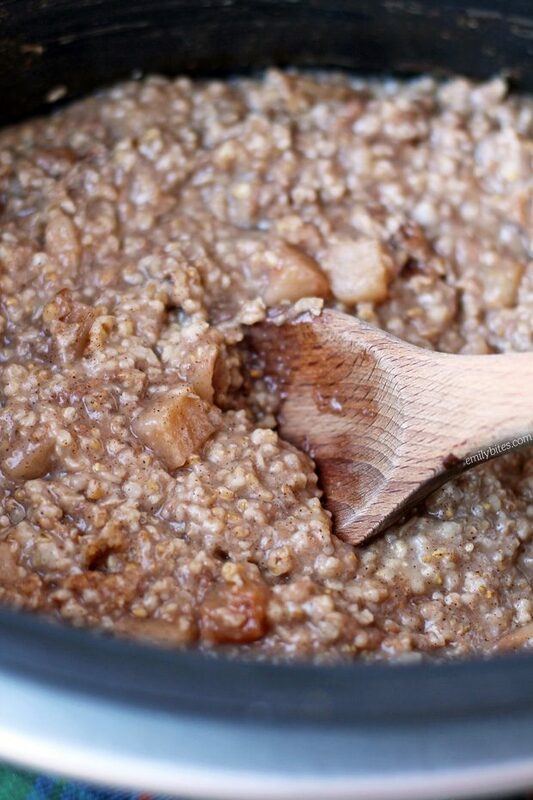 Did you definitely use the slow cooking steel cut oats and not the fast cook kind? I’m honestly not sure why that would happen because I’ve made this a bunch of times and it always works for me. I’m sorry! What brand of steel cut oats did everyone use who had success with this? I used bobs red mill and I got out meal soup that smelled great but was inedible. Could you cook on stovetop? I have made this a bunch of times and love it. Always comes out great. My only problem is it sticks to the bottom of my pot and I feel like I waste some not being able to scrape it out. Have you had this problem? Can I spray the pot with some cooking spray? I’ve been making this once a week all winter and it’s SO good! It reheats so well too. I increased the vanilla to 1 Tbsp and added about 1/2 Tbsp of nutmeg. Tastes like apple pie!